The throat chakra is where you receive and assimilate information, and also send information. It is associated with higher discretion, creativity and self expression. The challenge of the throat chakra is the ability to express yourself in the most truthful manner. When your throat chakra is balanced, negative experiences are transformed into wisdom. The success and failure of your life is dependant on this chakra. · You are not embarrassed by the truth, and find it easy to be honest about things. · You are able to express your thoughts and emotions easily. · You don’t over think what you are going to say, and you can get you point across easily. · You use empathy and compassion, and You don’t repress emotions because you are not afraid of emotions. · You use your intellect to solve problems, and people regard you as a leader. · You are a natural writer, artist, or public speaker, and people want to listen to you, read your books, hear you sing, or see your art. · People seek you out for advice because you are a good listener and have a sound, logical advice. · You talk too much, and feel the need to gossip, and tell lies to get attention. · The negative energy you are sending out comes back on you. · Or you may have low self-confidence and don’t speak your truth, express your emotions, or convey your ideas. · You have trouble speaking your thoughts, and you feel you don’t deserve that expression. · People misunderstand you, because you fail to communicate effectively. · You make things too complicated, intellectualizing your emotions. · You feel ostracized by society, and people think you are odd, because they are not able to understand who you really are. The throat chakra is the center of spiritual karma. Every choice you make, every thought and feeling you have, has social, personal, and global consequence. The throat chakra is strengthened and enhanced every time you express yourself with truth and integrity. Binaural beats can balance your throat chakra, exchanging negative thoughts for positive ones, helping you express your thoughts and emotions easily. The Throat Chakra is the chakra of communication, self expression and judgment. Also known as the Vishuddha, this Chakra rules self expression and speaking one’s truth, the written word, poetry, faith, and will power. On the flip side, the need to criticize, a lack of authority, and indecisiveness reflect an imbalance of the Throat Chakra. Information stored in the Vishuddha includes truth and self knowledge, your attitudes, and the physical senses of taste, smell and hearing. Throat Chakra imbalance may be experienced as poor self expression, habitual lying, learning disabilities, doubt, fear, and uncertainty. 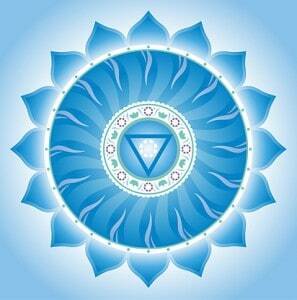 The Throat Chakra color is turquoise or aqua, with the secondary color as various shades of light blue. The Fifth Chakra is connected to the Fifth layer of the aura, the Etheric Template. This layer of the aura is a “template” for your physical body in the astral plane… such as, when a person experiences “astral projection” as if they are walking around in an invisible (to others) form of their physical body. Chakra Gemstones such as turquoise, fluorite, blue opal, blue topaz, or blue lace agate aid in Throat chakra balance. A pretty turquoise necklace might be just the thing to open up your channels of communication! The essential oils and flower essences used to balance the Throat Chakra are sage, lemongrass, cosmos, larch, blue chamomile, trumpet vine, geranium and hyssop. Foods to fuel the Vishuddha are liquids; water, fruit juice, and herb teas, plus tart fruit such as lemon, lime, grapefruit, or kiwi, and tree grown fruits such as apples, pears, peaches, apricots, and plums. Simple spices like salt and lemon grass help express the Throat Chakra. A crystalline Solfeggio tone of 741 Hz has been known to open and cleanse the 5th Chakra. Take 27 minutes with a pair of headphones and our Alpha Level Binaural Beats to freely speak your Truth. 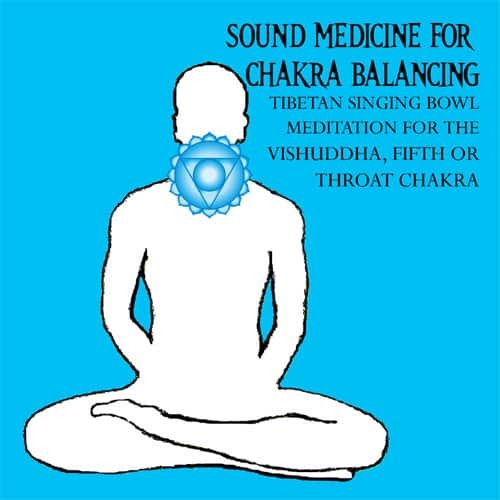 This Chakra balancing MP3 uses Tibetan Singing Bowls attuned to the frequencies of the Throat Chakra, and the Binaural Beats use a Solfeggio frequency of 741 Hz. The binaural beats progress along Earth Resonant frequencies, to a low of 7.83 Hz (the Shumann Resonance), and ramps back up to an Earth Resonance of 14.1 Hz. This deeply relaxing sound healing meditation will not only help balance your Fifth Chakra, it will also balance your mind and spirit to the frequencies of the planet Earth. Begin healing now. Balance your Throat Chakra with healing sound, color and words. Download the 27 minute binaural beat MP3, and the 8 minute MP4 video with 9 page PDF. 5th Chakra Binaural Beat MP3 and 8 minute MP4 video, Download Price $9.95. This Chakra balancing program includes an MP3 an MP4 and a 9 page eBook with complete information all about the Chakras. Our automatic download system will redirect you immediately to a download page, and also send you an e-mail with download instructions. If you don’t see the e-mail, check your spam filter. iPhone and iPad, don’t use Pay Pal. Click here for iTunes. iPad & iPhone click here. To Purchase the Throat Chakra Balancing CD for $12.95, click here. Are you using an iPad, iPhone or iPod? Click here to purchase on iTunes. If you like this video, you can download it for just $2.95. Includes a 9 page booklet all about the chakras. such as Fish pose, or “Matsyasana”, open and clear the Throat Chakra, and keep you flexible and relaxed.